A little while ago I showed you the Benefit Beauty Kit I hauled, so today kicks off the first review of one of the items I picked. 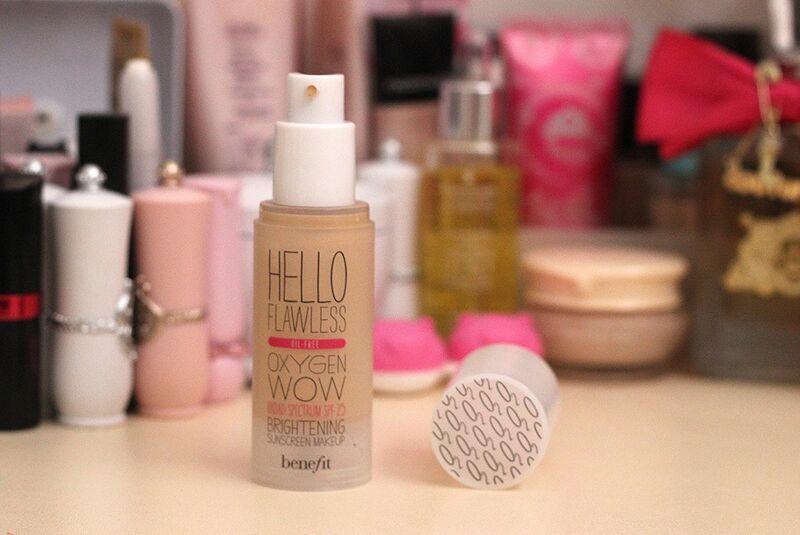 Benefit's Oxygen Wow Foundation is probably the most expensive foundation I've tried yet. And because I've been quite impressed with the few Benefit goodies I've tried so far, I did have high expectations for this foundation. Okayyy, this is the first time I've come across cancer prevention makeup! Well, I can't really say one way or another whether this foundation has decreased my skin cancer chances, so I guess I'll just tell you what I liked and disliked about it. The foundation came with a free sample of long wear primer, which I thought was a nice little touch. The packaging is clean and simple, with the foundation encased in a clear, plastic pump bottle. The top of the cap is embossed with little Oxygen symbols. The pump leaks a teeny bit, but it's not overly messy. I'm using one of the lighter shades "I'm pure for sure" Ivory - which is somewhat a weird name. All their foundation names are on the quirky side actually. It's a neutral shade for fairer skintones. At first glance, the shade did remind me of the Bourjois Healthy Mix Serum foundation in Shade 51, but with a little less yellow. It was a tad light on my NC25 skin when I first used it, but it did oxidise and adjust to my skintone a little after about 10 minutes after application. I'd say it's more suitable to NC20 skin though, which is what my skin is closer to at the moment. 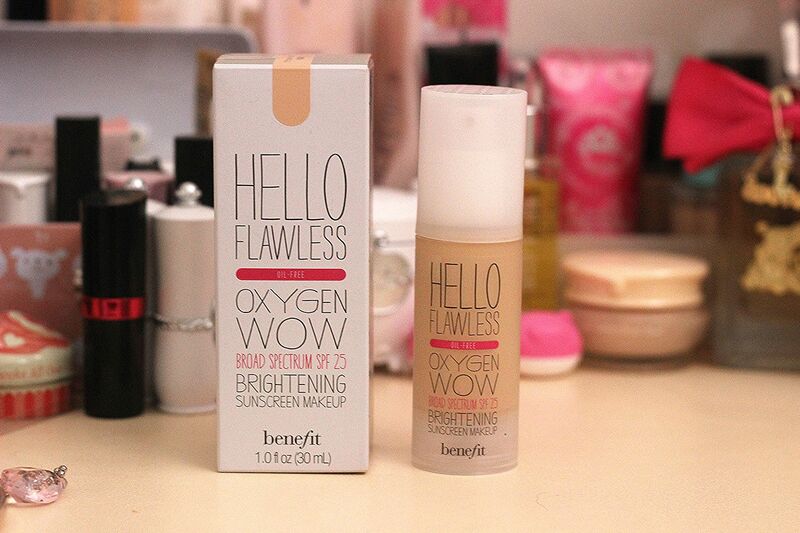 It definitely brightened my skintone a lot, giving it a more radiant and awake look. It doesn't have a lot of coverage - the coverage is sheer to light if applying with a brush, and light if applying with fingers. The coverage can be built up slightly after two layers, however I found that by doing so my skin began to feel a bit greasy after about 3-4 hours. The foundation isn't particularly long lasting, but I did find a little bit of finishing powder helped it stay a little longer. The directions actually say to reapply the foundation every 2 hours - which indicates it's not got a long wearing formula. I rarely reapply foundation though - that's just too much work for me! It evened skin tone, but didn't significantly cover facial redness or blemishes. It can apply patchy on dry skin, but otherwise the application is smooth and even, giving a natural, slightly dewy finish. I also liked that it didn't have a notable scent to it. For me I was kind of disappointed with this foundation. 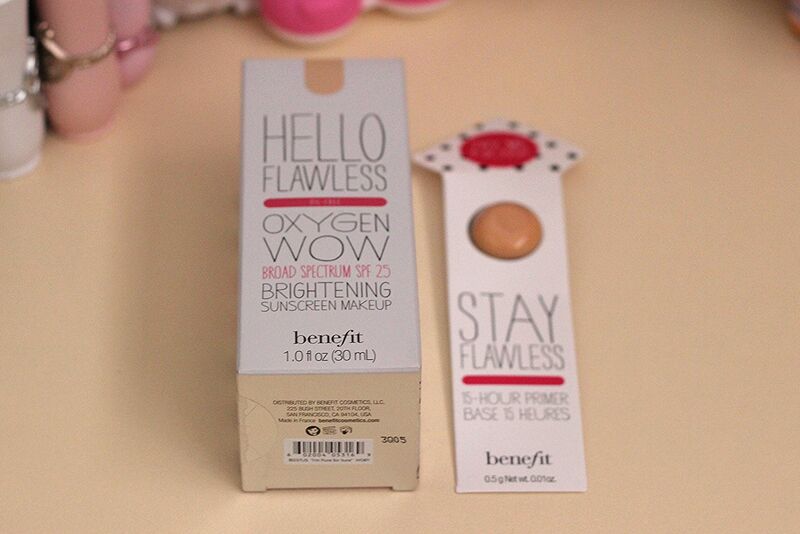 I liked the brightening, radiant finish, however the coverage and lasting power didn't meet my expectations - especially given it's got the word 'Flawless' scrawled across the packaging. It's also kind of really pricey for what it does! I bet people with already great skin would like this for it's sunscreen protection, and sheer and brightening coverage - but those looking for long wear formulas or better coverage better look elsewhere. That's it today lovelies - thanks for reading! 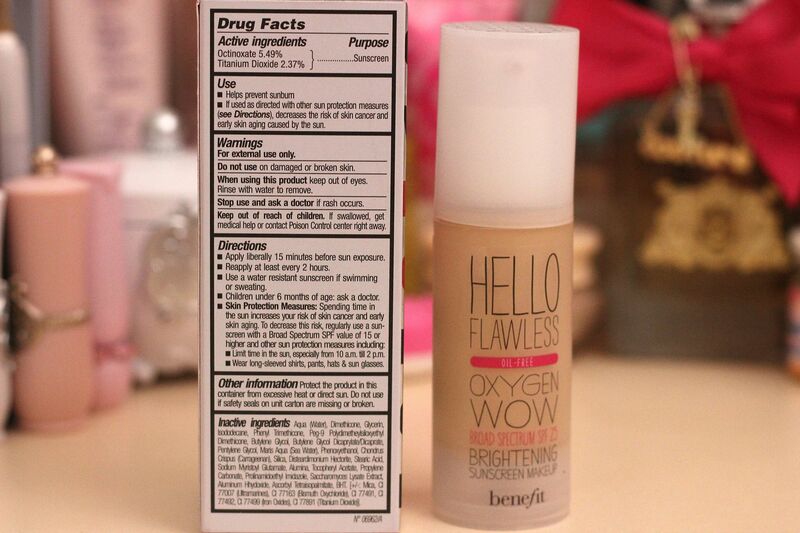 I have this foundation but I didn't like it.. Prevents cancer?! That's a pretty big claim!! I guess anything with SPF is cancer preventing. Haha! I guess that's true, hehe! I know right, what girl has time to reapply makeup every 2 hours?! It's a pretty unique claim, lol. Yup, every 2 hours is kind of overkill, I reckon! Glad I'm not the only one who didn't like it! I read a lot of positive reviews which is why I decided to choose it. Yup, I think there are cheaper alternatives out there! Yup, it's alright for natural coverage, but I can't really justify the price since there are cheaper natural coverage foundations out there! Aww, it's a shame it broke you out! Well, I'm glad it didn't break me out, otherwise the review would be even more negative, lol. Yup, not many brands do that! Yes it was a disappointment since I've been impressed by every other Benefit product I've tried so far! ehhh...really?I thought this was highly raved..I guess I have to re-think of buying this..